LG caused a collective jaw drop last year when it announced that its new flagship phone will have a massive, incredibly sharp screen - 5.5" at QHD. It kept those measurements for 2015 (there's really no sane way to increase them further) and worked hard to improve the image quality. The new Quantum Display is similar to Sony's Triluminos display, both companies competing in the TV panel business. LG turned to DCI (which normally works with TV studios) to calibrate the LG G4 display, achieving 98% coverage of the DCI standard, which means accurate colors with no oversaturation. If anything, lack of saturation was the problem with LG G3's screen, colors looked dull in comparison. The other major issue was the contrast, which was quite low. The Quantum Display fixes both of those niggles. Colors are vivid (but not oversaturated) and viewing angles are perfect. The display is marginally dimmer (hard to notice without measurement equipment), but black levels went down which pushed contrast way up. We have one complaint here - the brightness slider isn't smooth, at 50% it's barely 110nit, which is too dim for daily use. Going lower than 50% is as good as switching off the screen. The LG G4 comes with the full connectivity suite. It has 4G LTE for up to 300Mbps of download and up to 50Mbps of upload and 3G HSPA+ (42.2Mbps/5.76Mbps) when you're outside of 4G coverage. Wi-Fi 802.11ac is no surprise, you can use the latest Wi-Fi routers at home at either 2.4GHz or 5GHz. There's also Bluetooth 4.1 with Low Energy mode and apt-X for better audio streaming. NFC is on board as well. For file sharing you can use ShareBeam, which is LG's take on Android Beam. For wireless multimedia streaming there's DLNA and Miracast (which can mirror your phone's screen). There's also the wired option with SlimPort 4K, which lives in the microUSB 2.0 port. For old-school TVs you can use the IR blaster and QRemote. The app can also control audio equipment, projectors and air conditioners. The LG G4 comes with a 3,000mAh battery - the same capacity as the G3 and the G2 before it. The G2 was a battery life king, but the G3 was quite average. Our tests show that the LG G4 also fails to recoup the G-series former glory. 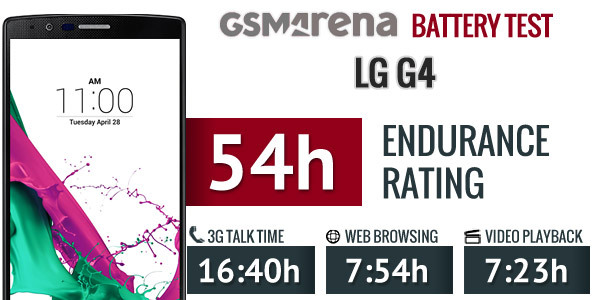 The Endurance rating worked out to 54 hours, 9 hours less than the G3. The issue was with the high standby power draw, which puts a strain on the battery even when you're not using the phone. The other disappointment was the talk time, which couldn't reach 17 hours - an 8 hour drop from the G3. We reran the tests several times and kept getting the same results. The LG G Flex2 got basically the same results so we wonder how much responsibility Qualcomm shoulders for the lackluster battery life. Anyway, the web browsing time was pretty good - nothing spectacular, but good. It also marks the only improvement since the G3 as the video playback is below average for the flagship class.